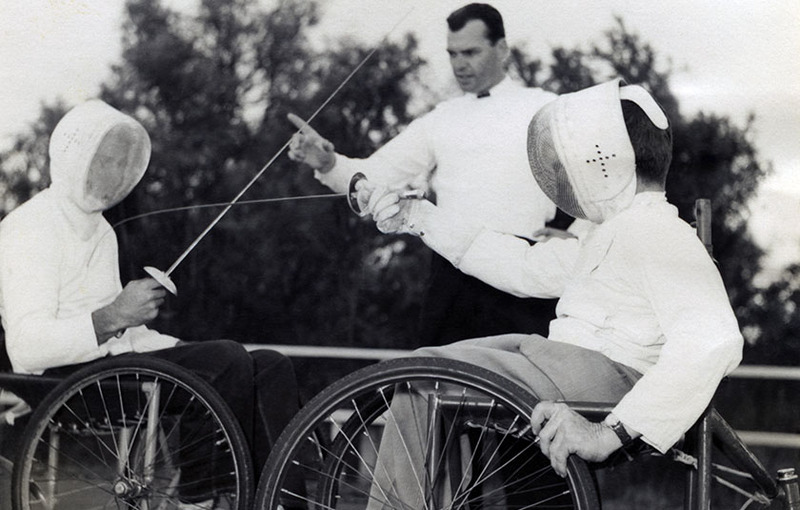 Wheelchair Fencing was introduced at the 1960 Paralympic Games in Rome and has remained on the Paralympic program ever since. One of the most striking features of the sport is that athletes compete in wheelchairs that are fastened to the floor. These chairs allow the fencers freedom of movement and the activity is fast-paced, dynamic and spectacular. The first ever gold medal won by members of an official Australian Team was won by Frank Ponta and Bill Mather-Brown in the team sabre event at the 1957 Stoke Mandeville Games. However, since then Australia has won just two Paralympic medals in Wheelchair Fencing. At the 1964 Tokyo Paralympics, Frank Ponta took out the silver medal for the men’s foil and Daphne Ceeney (nee Hilton) won the bronze medal in the foil event for women. France is the powerhouse nation in wheelchair fencing. Currently there are two classification categories. Category A is restricted to fencers with a fully functional fencing arm and good trunk control. Category B is for those with less functioning trunks, legs and fencing arms. Within these classifications, there are three weapons including epee, foil and sabre. Men compete with all of these weapons, but women are restricted to foil and epee events. Competition for men and women include both individual and team events.